Yes, while FIDE upsets various established tournaments with the announcements of the FIDE Candidates taking place later this year , the Candidates for the T9030 website kicked off last week. As a former group winner ( although I think I only played about 3 or 4 games to qualify, as one of the 4 in my group 'dropped out' ) I was eligible to join, so this time around, I did ! The pairings meant that I ended up against a player significantly higher-rated than me ( some 300 or more points :) and quite honestly, having switched to a Friday night at my opponent's request, I wasn't really in the best physical and mental state to play after a week's work. Regardless, after sacrificing at the altar of Caissa, I set down to play in as spirited and adventurous a style as I could. In my opinion, it would be pointless trying to play a defensive match, or for a draw. Four TL games in just over a week, means I haven't posted much recently. These games were all good and I felt I played well in all of them, but came away with 2 wins and 2 losses. Both losses as Black, both in U1800, and probably both through my mistakes. Wins both as White, both in U1600 and both against the French ! Make of those what you will, but it leaves the team in a good position in U1600, and struggling in U1800. 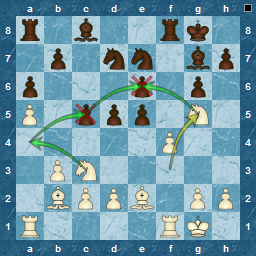 This was from a French Defence, which was an interesting positional game, with much manoeuvring until the exchanges started ! I had played an early a4, and saw the benefits of that after Black played a less active Rf6 to protect his e-pawn, rather than Rxf4 or exf , either of which might have left things equal. Although I went up 2 pawns, he played until I created the unstoppable passed pawn. A tough and enjoyable game. 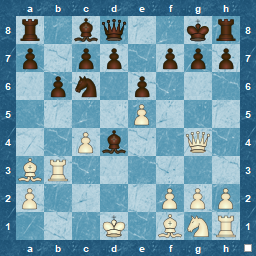 Next up I was Black against my only d4 opening, and it led to a long positional-type game, something I rarely play.